(CNN) - Democratic Sen. Chuck Schumer, part of the bipartisan "Gang of Eight" on immigration reform, predicted Sunday that the Senate will pass his group's bill by July 4. "We're going to put immigration on the floor by June 10. I predict it will pass by July 4," he said. "We're hoping to get up to 70 votes." But is Schumer engaged in wishful thinking? His comments came just days after a new Quinnipiac University poll indicated more than two-thirds - 71% - of Americans doubt Congress can work together to move forward on immigration reform. Schumer's optimism also came just over a week after his fellow Gang of Eight member, Democratic Sen. Bob Menendez, warned that the group didn't yet have the 60 votes needed to overcome a filibuster in the Senate. Schumer also vowed the string of recent controversies hitting the Obama administration will not be a distraction. "We are moving forward because we believe in a bipartisan way this is so vital for America. We'll have a good bill," the senator from New York said on NBC's "Meet the Press." And despite warnings from the GOP-controlled House of Representatives that the Senate bill will fail to gain traction, Schumer argued House Speaker John Boehner will have no choice. "Congressman Boehner is in a box. There are about 60 or 70 of his people who are against any immigration reform," Schumer said. "But at the same time, he knows that the Republican Party will be consigned to a minority party for a generation if they're anti-immigration." If the Senate can gather a majority of Republican senators and almost every Democrat, then "that may change the equation in the House and the thinking in the House among mainstream Republicans," Schumer said. "They may want to go for our bill." Not so fast, said Republican Rep. Ileana Ros-Lehtinen. The congresswoman from Florida said Sunday the "Senate bill is not going to move in the House." "I think the speaker has made it clear that we will have our own work product," she said on CNN's "State of the Union." While a bipartisan group has been working on an immigration plan in the House and says it has reached a deal, the group has yet to formally introduce its legislation. Boehner has applauded that group's efforts and said in a joint statement with the other three top House Republican leaders that the House will take its own path on immigration. "The House remains committed to fixing our broken immigration system, but we will not simply take up and accept the bill that is emerging in the Senate if it passes. Rather, through regular order, the House will work its will and produce its own legislation," the GOP leaders said. Ros-Lehtinen said Boehner favors a "piecemeal approach" rather than a comprehensive package like the Senate bill. "I don't know if we'll have comprehensive reform or we will have it piece by piece, but that Senate bill may not even pass the Senate itself," she added. Rep. Bob Goodlatte, R-Virginia, further backed the step-by-step approach and argued on "Fox News Sunday" that any bill passed should not include a pathway to citizenship - something that's included in the Senate bill. As for legal status, Goodlatte takes the position of many Republicans, stating that the government must enforce several other border security and interior measures first. On the same Fox program, Rep. Chris Van Hollen, D-Maryland, said Congress should be able to tackle multiple issues at a time, including immigration in addition to the recent controversies surrounding the IRS and the Justice Department. "We should be able to walk and chew gum at the same time," he said. I would give it about the same odds as I would the second coming of Jesus Christ, occurring by July 4th. The ancients believed that one was likely to die on one's birthday, so they'd see the significance. Did someone actually put "WORK" and politician in the same sentence? What do Republicans have to do between pheasant and deer season? Load their high-capacity magazines for the next round like the game is going to shoot back. Immigrants??? We don't need no stinkin' immigrants here - we got rid of all the manufacturing jobs we could.!!! What's the difference between crap and republicans? 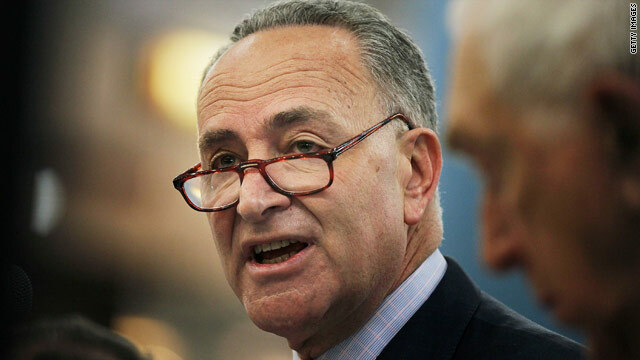 N O T H I N G.
The mindless liberal schumer also shot his mouth off over gun control, and he looked like the liberal fool that he is when his anti-gun rhetoric was rejected. Schumer is a classic example of why we need term limits on these jokers. I have contacted my Senators on numerous occasions to reject the amnesty for illegals and close down the southern border to stop these criminal illegals from passing through Obama's porous border. It will die in the house just like everything else. The unemployment rate is still stuck over 7% and they want to flood the job market with criminal immigrants. Way to kill the US on it's birthday, Chuck... Way to go!!! Let all illegals in this country have new cars, free medial and dental plus free education to also include college. And the round eyes need to pay for all of this. Isn't that want Congress wants but only if illegals promise to always vote democrat. Okay IRS....I do not pay taxes for you to spend the money this way. I know my taxes can do good things. But I DO NOT approve of this. I think every year I should be allowed to say what I will and will not support. I DO NOT SUPPORT THIS. he Border Security, Economic Opportunity and Immigration Modernization Act, S. 744, is a monstrous 1,076 pages, up from 867 pages pre-committee mark up which in turn was increased from its original 844 pages. Schumer’s biggest problem in selling his bill isn’t it imposing, unreadable length but its destructive contents. Earlier this year when the Gang of Eight was drafting the bill behind closed doors, Schumer and his gangster colleagues promised that border security would be first and foremost before a single illegal alien became legalized. Schumer also pledged that the aliens would pay back taxes, fees and learn English, all of which turned out to be bold-faced lies. S. 744’s final 1,076 page version, the one that will be debated next week, contains no true border security provisions. During the three week mark-up process, Schumer beat back Senators Ted Cruz, Jeff Session and Chuck Grassley’s amendments to secure the border. In fact, the Committee defeated every amendment that was designed to show good faith to the public by requiring some enforcement before giving amnesty benefits. What is in the bill will be tough to sell to the public. Within a decade, S. 744 will authorize 33 million work permits to foreign-born visa holders — more than the total number of visas issued from 1972 to 2012— plus millions more guest workers and their families.The Judiciary Committee refused to acknowledge the bill’s devastating consequences on 20 million unemployed or under-employed Americans who have struggled through years of wage stagnation and can’t find a job in the midst of the current labor glut. The committee also rejected attempts to speed up a mandatory E-Verify system that would insure that all U.S. employees are legally authorized to work. E-Verify is crucial to end the jobs magnet that draws thousands of illegal aliens to America. States were denied the option having a faster time-table on mandatory E-Verify than the five year minimum the bill sets for the federal government. Because of ambiguities and loopholes in the language, even the five year federal provision is squishy. Finally, the committee refused to require electronic monitoring for guest-workers in the new W visa program for low-skilled overseas employees to ensure they leave when their visas expire. Those are only some of S. 744 most glaring flaws. Schumer promised that “the bill will pay for itself.” But according to the Heritage Foundation’s Robert Rector, the taxpayer’s net cost will reach $6.3 trillion. As for Schumer’s guarantee that back taxes will be satisfied and English learned, those turned out to be more lies. Nowhere in 1, 076 pages of legislation are taxes or language mentioned. S. 744 is great for cheap labor seeking employers, unions that want to shore up their dues-paying base, ethnic-identity lobbyists who want to wield more power, immigration lawyers and, of course, the aliens themselves. But for American workers and taxpayers who want to protect the nation’s sovereignty, S. 744 is a disaster that the Senate must vote down. All of immigrants called "illegals" could support themselves even support their loved ones still in their homelands. Ironically. not a small part of them will be qualified for financial helps from the FED after being legalized!!!! Breaking the laws is not bad, be patient, you will be reward eventually. The reform, in fact is a loud invitation from our leaders: " Come in, the next reform is not far away from this". Poor legal immigrants!!!!. they have been on the waiting for years, now have to move back a bit longer to make room for the new ones. The last 'Comprehensive Immigration Reform' bill (1986) was supposed to correct this problem and 'legalized' about 2.5 million people, but it failed to solve the problem because the government failed to ENFORCE that law. The problem is now 4 times as big, and what assurance do we have that this law will be any different when it benefits the Democratic Party NOT to enforce it? Will we just have to go through this process again in another 30 years because this new bill will also not be enforced, and we have another 40 million illegal immigrants seeking 'their share'? What's the point of passing laws that are not enforced? I don't think the Dem socialists can muster the votes. The public KNOWS it is bad for the people of America, to pass any such "reforms", because in the end, it is all simply another "handout" to get votes, for the Dem socialists. this reinforces the amount of efficiencies gained by the flat tax. get rid of the IRS waste, everyone benefits. If Schumer had a son he would look like Weiner. Hope not just like Obama care it needs more work. If the border isn't fully secured first it shouldn't pass. E-verify should also be mandatory. As long as Republicans have any which way they can of not granting citizenship therefore the vote to Illegal immigrants they will stop any immigration legislation. Thats the b'all and end all of why immigration legislation will not pass as Republicans know 70-80 percent of Mexican or Hispanics as citizens would vote democrat. Or put another way why a 13 year route is in the Senate bill to keep democrats on board! !And republicans thinking they may have time to change voting tendencies in that time frame. Yawn!! I love how the GOPTP create controversies, FAKE AS THEY ARE, they are indeed a distraction. The DEMOCRATS need to start HITTING THE GOPTP with more. The DEMOCRATS have real issues on the GOPTP, I hope they use them soon. IMMIGRATION FAILURE IS ONE OF THEM! Typical government run amuck. I hope they all claimed the benefit on their taxes. Why in the world would we want to bring in 33 million more people in the next 10 years? That is what this bill does. That equals the population of Canada. That is why this bill is crazy. Mr. Schumer, you can take in as many illegals as your household can sustain but not on mine.